I recently spoke with Oversight Systems, an operational intelligence analytics company that uses predictive analytics and optimization to help companies save money, reduce the risk of loss and fraud, and reinforce corporate governance and compliance efforts. Ventana Research views operational intelligence as an emerging technology with the potential for a high return on investment. By continuously monitoring activities in a company’s IT systems, Oversight’s Web-based software continuously, consistently and objectively monitors all business processes to identifies opportunities to save money, cut fraud, minimize risk and provide real-time controls to support governance. What’s the Rush in Adopting IFRS? I have commented before on the movement to adopt International Financial Reporting Standards (IFRS) by the United States to replace US-GAAP (Generally Accepted Accounting Principles). Most recently I discussed the drive to harmonize the significant differences between US-GAAP and IFRS on revenue recognition and lease accounting. To those who are interested in but not intimately involved with the subject, I suspect the current situation is a bit confusing, since there are multiple groups involved in the discussions on how best to proceed, each with its own agenda. The full adoption issue remains in flux, but let me weigh in the matter. SAP is planning to acquire e-commerce company Ariba in a transaction worth about US$4.3 billion expected to close in the third quarter of this year. Ariba provides cloud-based collaborative business commerce through a Web-based trading community that enables companies to find, connect and collaborate with a global network of partners. Its Commerce Cloud is a platform that businesses can use to buy and sell goods. Currently, Ariba counts more than 700,000 companies worldwide attached to this network. The purchase follows SAP's acquisition of cloud-based HR software vendor SuccessFactors for $3.4 billion. In the past SAP had been reluctant to make large acquisitions, but these two large purchases and the naming of Lars Dalgaard, former SuccessFactors CEO, to the SAP executive board indicate the strategic imperative SAP puts on quickly gaining a solid cloud presence. The acquisition also complements its 2011 acquisition of Crossgate, an electronic data interchange (EDI) service provider, which enables companies to exchange documents with customers, suppliers, supply chain partners, financial institutions and government entities, streamlining transactions and cutting administrative costs. I recently attended Vision 2012, IBM’s conference for users of its financial governance, risk management and performance optimization software. I reviewed the finance portion of the program in a previous blog. I’ve been commenting on governance, risk and compliance (GRC) for several years, often with the caveat that GRC is a catch-all term invented by industry analysts initially to cover a broad set of individual software applications. Each of these was designed to address specific requirements across a spectrum of users in operations, IT and Finance within a company, often to meet the needs for a specific industry such as financial services or pharmaceuticals. Vision 2012 covered a lot of ground under the GRC heading, confirming the breadth of both this software category and IBM’s offerings in it. I want to focus on two areas: automation of IT governance activities and effective management of GRC-related data. I recently attended Vision 2012, IBM’s conference for users of its financial governance, risk management and performance optimization software. From my perspective, two points are particularly worth noting with respect to the finance portion of the program. First, IBM has assembled a financial performance management suite capable of supporting core finance processes as well as more innovative ones. It continues to build out the scope of this suite’s capabilities to enhance ease of use, deepen the capabilities of existing areas and broaden to coverage to complementary or immediately adjacent software categories such as its pending acquisition of sales performance management vendor Varicent Software (covered by my colleague Mark Smith). More specifically, automating management of the extended financial close – that is, all activities from closing the books through filing financial reports with regulatory bodies such as the Securities and Exchange Commission (SEC) in the U.S. or the FSC in the U.K. – is growing increasingly important as regulatory requirements for external financial reporting expand. Companies that have adopted software to manage the extended close are demonstrating the value of using it. JDA Software is an established vendor of (among other categories) accounting software for the retail sector. So it is a bit ironic that the company is in the process of restating its earnings for 2008 through 2010 because of revenue recognition practices that led it to book some revenue sooner than it should have. The issue centers on certain transactions the company linked to service agreements and license revenue. As well, in 2009 and 2010 some of its license contracts included a clause protecting customers if certain products were discontinued, which can be construed as promising a future deliverable that would have required a delay in recognizing some or all revenue from those license contracts. Also, JDA is re-evaluating vendor-specific objective evidence (VSOE) for its Cloud Services in 2008 through 2010 to determine whether it met the appropriate requirements to recognize revenue at the start of those contracts; otherwise revenue would have to be prorated over the life of the contract. For a public company, any accounting restatement is serious, and JDA’s stock price has declined since the start of the year, but this seems to be due more to a fourth-quarter 2011 revenue shortfall relative to expectations and a downward revision in earnings expectations than to the restatement. The changes it is likely to make are more optics than substance, which accounts for the muted response from the market. For at least a couple of decades completing the financial close within five or six business days after the end of the period has been accepted as a best practice. As such, that creates an expectation that finance organizations that take longer should work to reduce their closing intervals. 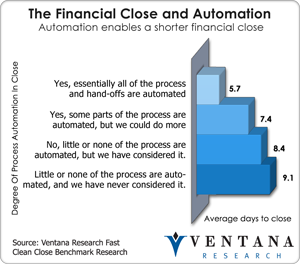 In updating our last benchmark research on the closing process, Ventana Research has found this not to be the case. In fact, the latest research shows that many companies are taking longer to close today than they did five years ago. Whereas nearly half (47%) were able to close their quarter or half-year period within six business days back then, just 38 percent are able to do so now. Similarly, five years ago 70 percent of companies were able to complete their monthly close in six days; today only half can. To be sure, closing quickly still gets lip service: The research confirms that most companies (83%) view closing their books quickly as important or very important. Yet far from demonstrating progress, the results show slow closers are regressing. I recently attended the 2012 Global Pricing Forum hosted by Nomis Solutions, a provider of software and services to banking and finance companies. This annual event brings together thought leaders and practitioners in the area of pricing and revenue optimization (PRO). This technique uses analytics to sift through large data sets to tease out customer behavior characteristics, identify customer segments and quantify their price sensitivities. These complex calculations require software designed for the purpose, but most in the financial services industry rely on older methods that produce less-than-optimal results. Analytics can help organizations more carefully manage the process of defining offers to customers (especially the levels of discretion offered to account managers and sales people) and the terms and conditions. One of the new products that Infor announced at its recent Inforum user conference (which I covered here) is Local.ly, which is designed to facilitate localization of its applications (that is, adapting them for languages, units of measure, statutory requirements, customary processes and other specific features of the places where they will be used). Local.ly is scheduled to be released in the third quarter of this year. Infor points out that among other tasks the software can be used to facilitate tax provisioning outside a corporation’s home country, thereby reducing the costs associated with determining tax liabilities. I think it also can be useful in calculating income taxes everywhere, especially for larger customers of Infor that have even a moderately complex corporate structure. Here’s how. The entity structure of a company affects its tax management processes. Our benchmark research finds that among companies with 100 or more employees, 43 percent have relatively complicated corporate structures, which is to say they have some combination of many legal entities and complex ownership configuration. This general finding masks a substantial disparity based on size. Relatively few (27%) midsize companies (those with between 100 and 999 employees) have complex corporate structures, large companies (those with between 1,000 and 9,999 employees) are split between simple and complex structures (56% and 44%, respectively), and almost all very large corporations (those with 10,000 or more employees; 88%) are overwhelmingly complex in their structure.